Free ABS “Postal Areas” – you get what you pay for! It’s great the ABS have made accessing census and standard geography data so mush easier, and of course as all taxpayer funded data sets should be, at not cost. 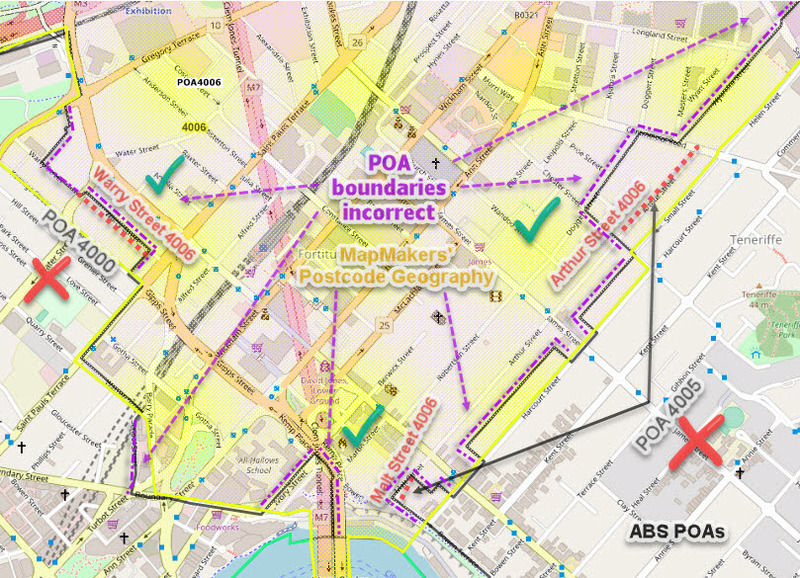 Some, wishing to leverage postcode information, see what they wish to see – ABS postal areas (POAs) = postcode areas. Not so..
POAs don’t honour state boundaries where a postcode is common to two or more states / territories – here’s a broad indicator of where these occur, there are quite a few.. In addition, quite a few postcodes are simply absent from the POA data. Here’s a screenshot of the relevant ABS quality statement. We’ve made a copy available for download to save you hunting around in the ABS basement! As we’ve pointed out in previous years – and the ABS make this clear, to their credit – POAs are an approximation only. Not only are there missing “postcodes” and open borders, the POA borders themselves are often incorrect for postcodes. 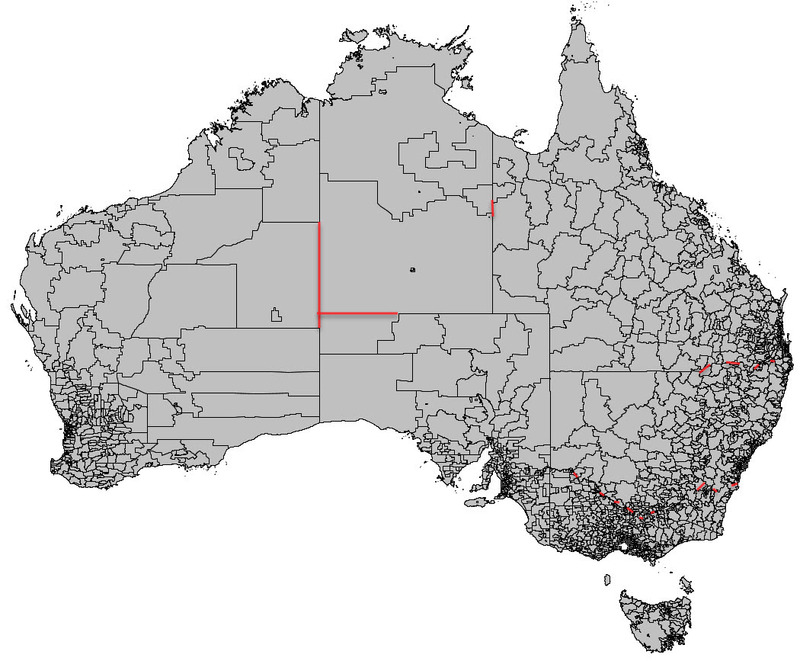 They tend to be inaccurate in regional Australia as they are snapped to “standard mapping features” such as drainage lines – only the same as a postcode boundary by coincidence. While not as widespread, it can be an issue in established metro areas too, as this illustration for central Brisbane using POA 2016 and MapMakers GIS Data series illustrates..
Great if close-enough-is-good-enough, maybe. 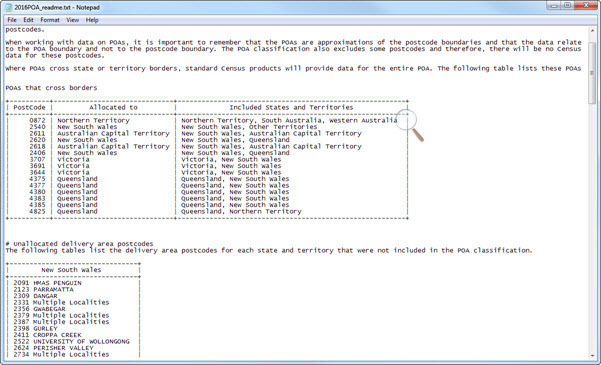 However if you want to get the most from your in-house data, you’ll need a product which honours not only state borders, but includes all current postcode boundaries. Get standard GIS postcode geography here, or the fantastic census enhanced versions here. All MapMakers’ postcode products are covered by a 10% price guarantee. In case you desperately must have the POA product but honouring state boundaries, even though it performs over ten times slower in any given environment than MapMakers postcode products, we have created an update and it’s available for a flat $1500 ex. Send us an E-mail for more info or to place an order.